I've decided that I am going to write-up a different horror film every day in October until Halloween. 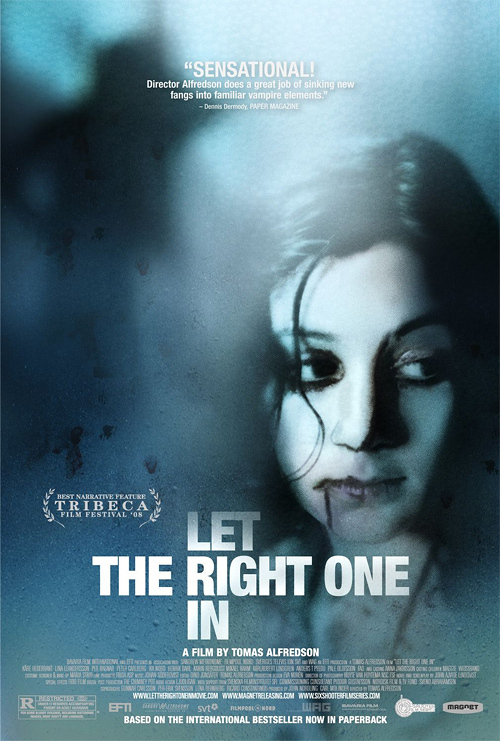 For my first entry, I chose what is perhaps the finest horror film of the last decade, Tomas Alfredson's Let the Right One In. While it was given an excellent American remake in the form of Matt Reeves' Let Me In in 2010, the original remains the most elegant adaptation of John Ajvide Lindqvist's novel. Twilight may have dominated the vampire landscape of the aughts, but Let the Right One In is vampire romance done right. At its heart is a tender love story between a bullied 12 year old boy and the enigmatic vampire girl that moves in next door. I've always been a sucker for puppy love stories, but this one isn't all sunshine and rainbows. It's a dark, violent tale that doesn't shy away from the inherent horror and tragedy of its subject. Even its seemingly happy ending is overshadowed by the vision of its future we saw in the relationship between the young girl and her mysterious father figure. While the film downplays the homosexual undertones of the novel (although not quite as much as its remake, Let Me In), where Eli is actually a castrated vampire boy who is mistaken for a girl, the subtle suggestions remain. No matter how you interpret the story, however, it's still a haunting tale of unconventional, forbidden love wrapped up in ancient vampire lore and adolescent angst. Few other horror films in recent memory have been so beautiful, and yet so horrifying.